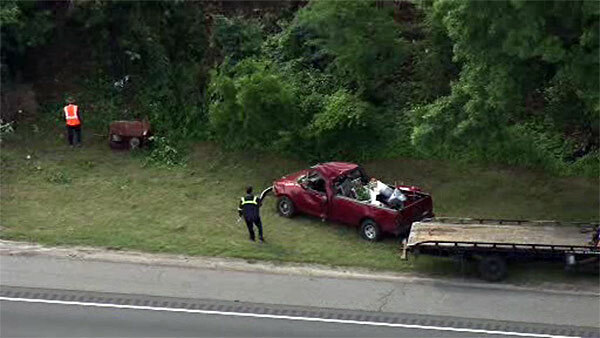 Pickup truck crashes on I-295 in Logan Township, N.J.
LOGAN TWP., N.J. (WPVI) -- First responders were on the scene of a crash involving a pickup truck on I-295 in Gloucester County, N.J. It happened before 8 a.m. Thursday in the northbound lanes near mile marker 9.2 in Logan Township. Action News is told the driver lost control, and the truck ended up deep in some woods near the highway. Video from Chopper 6 HD showed a red pickup truck with extensive front end and roof damage that crews had pulled from a wooded area. There was no immediate word on the driver's condition or what caused that person to lose control.